Authorities say two people were injured when a public transit bus and a tractor-trailer collided in Pawtucket. WJAR-TV reports that the crash occurred at the corner of Church and Pine streets at about 1 p.m. Tuesday. 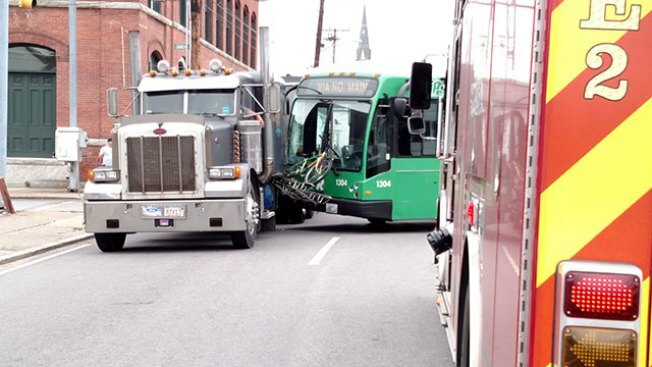 Passengers on the Rhode Island Public Transit Authority bus say it was making a turn when the tractor-trailer ran a red light and hit the bus. A RIPTA spokeswoman told The Associated Press that two people were brought to a hospital with injuries. It wasn't immediately clear how serious the injuries were. There have been four pedestrian-related accidents involving RIPTA buses in the past 18 months, including one in March that killed a 9-year-old Providence girl. Police said the driver wasn't at fault.